18th annual Dr. Manfred Lehmann Memorial Israel Day Concert a joyous celebration of Israel's 63rd birthday. The 18th annual Dr. Manfred R. Lehmann Memorial Israel Day Concert in Central Park set the tone for an ebullient celebration of Israel's 63rd birthday, as premiere entertainers and prominent speakers, including Republican presidential hopeful Herman Cain, appeared before tens of thousands at the Summer Stage in the park. The thousands of "Celebrate Israel" parade participants and spectators filed into Central Park after the conclusion of the 47th annual parade for some traditional Jewish entertainment and enlightenment. This year's concert was dedicated as a memorial tribute to Carl Freyer, z"l, the founder of the Israel Day Concert in Central Park. A magnanimous supporter of numerous causes impacting every aspect of Jewish life and the State of Israel, Mr. Freyer was also a founder of the Arutz Sheva web site, a founder of the National Jewish Outreach Program and a leader in the nationalist camp for many years. Also remembered for their generous support of Israel were noted Jewish activists and philanthropists the late Dr. Manfred R. Lehmann, and Rose and Reuben Mattus of the Haagen Dasz ice cream company. As in previous years, the Israel Day Concert was organized by renowned gastroenterologist and Jewish activist Dr. Joseph Frager. Serving as chairpersons of the concert were longtime Jewish activists Dr. Paul and Drora Brody. The special guest speaker at the concert was Likud MK Danny Danon, chairman of World Likud and Deputy Speaker of the Knesset. He was introduced by Dr. Brody, who quipped, "Mr. Danon signals right and he turns right." Reiterating his support for a united Jerusalem, MK Danon declared his staunch opposition to US pressure on Israel to retreat to the 1967 borders, termed the Auschwitz lines" by Abba Eban. "80% of Israelis polled are against compromise of any form on the status of Jerusalem as Israel's capital," said Mr. Danon, adding, "David Ben Gurion moved the Knesset from Tel Aviv to Jerusalem. Levi Eshkol did not differentiate between eastern and West Jerusalem or who lived there before 1967 and who lived there after that." Echoing Mr. Danon's sentiments were New York State Assemblyman David Weprin, who also strongly chastised President Obama. "As long as the terrorist Hamas organization represents the PA, peace will never be achieved. If we want to get some inkling what will happen, let's just look to Gush Katif and we will get some idea of the kind of false 'peace' we are in store for," he intoned. The featured musical personality at the concert was longtime Jewish singer and songwriter Avraham Fried, who regaled the audience with some of his classic hits of faith in G-d and the Jewish people's longing for redemption. Singing several sets of songs including "Jerusalem" and "Only You," Mr. Fried got the crowd on its feet as hundreds sang along and danced to lyrics praising Hashem and the land of Israel. "Every moment of our lives, every moment of our history is directed by the Yad Hashem (Hand of G-d)," said Mr. Fried in a private interview. The musical stylings of Elram Amram and Shlomi Aharoni from Israel were also showcased as well as singers Avi Peretz and Ouri Bitan. The New York Boys Choir made their debut and the Israeli national anthem, Hatikva, was performed by Chazzan Chaim Dovid Berson, who also delivered an inspiring rendition of "Exodus - This land is mine - G-d gave this land to me." Rabbi David Algaze of the World Committee for the Land of Israel and the Chavurat Israel synagogue in Forest Hills, New York said, "Israel has tried to reach out in genuine peace on so many occasions and the last ridiculous attempt was during the 1993 Oslo accords. There is no clearer statement than this that peace cannot be purchased. Hamas does not want to accept the existence of a Jewish state. A Palestinian state means suicide bombers and rocket launchers in Hebron - but the greater the threat, the greater the danger to Israel also means the greater the salvation from Hashem, as it says in Psalm 92." Introduced by Dr. Joseph Frager was Republican presidential candidate Herman Cain. 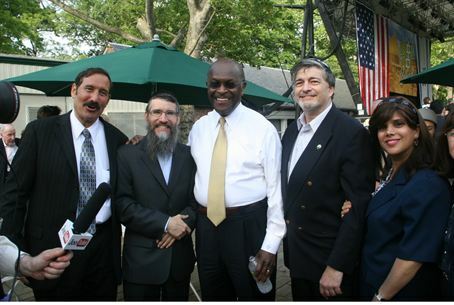 Having officially announced his candidacy on May 21st, Mr. Cain has been well received in Republican/Tea party circles. He is a businessman and former chairman and CEO of Godfather's Pizza, a newspaper columnist, and radio talk show host from Stockbridge, Georgia. He is also a former deputy chairman (1992–94) and chairman (1995–96) of the civilian board of directors to the Federal Reserve Bank of Kansas City. "I am here for two reasons," Mr. Cain told the audience. "I congratulate the State of Israel on this momentous occasion, and to let you know as a black man, I understand your struggle and share with you my undenying support for the one and only Jewish state." "My support for Israel started way before I decided to run for the presidency. It started with the old testament of the Jewish people and the biblical significance of that great nation. I am greatly disappointed in President Obama. He has thrown Israel under the bus, and I can assure you that I will never throw Israel under the bus. The president should not be defining terms of negotiations between Israel and the Palestinians; but rather he should leave Israel's borders alone", he declared to thunderous applause. "Jerusalem should remain united as the capital of the great state of Israel," Cain said. "I tell you today that I don't stand behind Israel, but I stand beside Israel as the great democracy it is in the Middle East." If elected president, Mr. Cain said, "I will tell those nations that threaten Israel's survival that if you mess with Israel, that means that you mess with the USA and you don't want to mess with the USA." In a private interview, Mr. Cain told INN, "I don't agree with the President Obama in terms of Israel making any more territorial concessions for an elusive 'peace.' The bigger issue here is that Hamas has now partnered with the Palestinian Authority, and negotiating with a terrorist organization will go nowhere. I think it is downright arrogant for the president to even suggest that our loyal friend and stalwart ally, Israel, has to jeopardize its own security to appease our enemies in that region of the world."